Since I am still in holiday mode I will leave you with a question today. Do you have any idea what this piece is about? I will update you later….. much later. 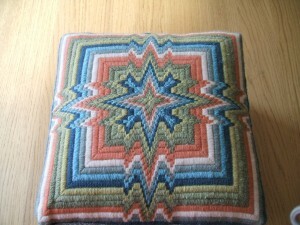 This entry was posted in Crafts on March 31, 2010 by Grannymar. Is it only four days? Four days since the Party of the year that The Irish Blog Awards 2010 was and is, since the buzz from it still goes on in my mind. Once settled into our abode for the night, we quickly abandoned George, primped, preened and prepared to set out and play, we gathered Sharon and Louise and the four of us hailed a taxi and headed off. 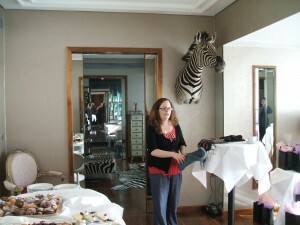 First stop was the The g 5 star hotel in Galway Ireland, for the Longlex Ladies Tea Party. As we were escorted to the Linda Evangelista Suite we had the opportunity to soak up inspiration from the king of heads Phillip Treacy responsible for all the interior design. Sabrina Dent our Hostess for the day and Founder of the Ladies Tea Party was waiting to greet us. Smiling as always through the pain and discomfort of a shattered shoulder. We arrived in time to assist with that sling. Being the first guests to arrive gave us the chance for a good old nosey about. 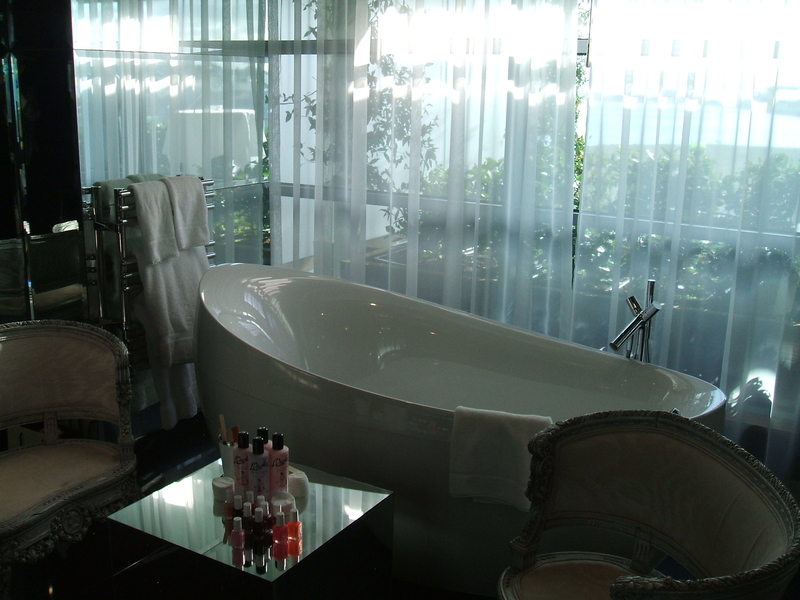 The bathroom had one wall of glass with a view out over Galway Bay and the other three and the ceiling were mirrored. For the day it was set up as a Nail Bar and most of the ladies present got their talons painted for the evening ahead. 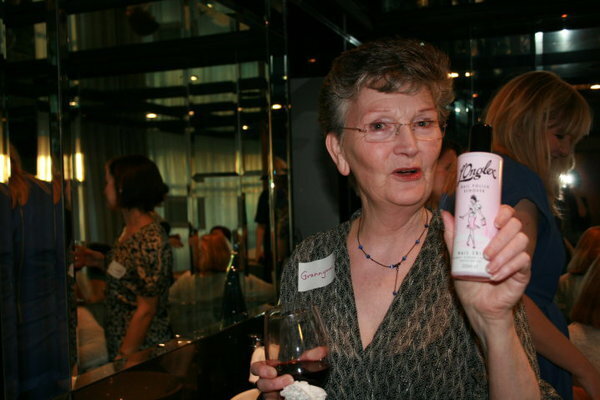 Thanks to L’Onglex the sponsors for the generous freebies of nail varnish remover in gift bags AND for supplying the nail bar goodies, to Ruth Crean for the pretty pocket mirrors, not forgetting Curious Wines for the generous quantity of excellent wine. Our gifts of nail care products. 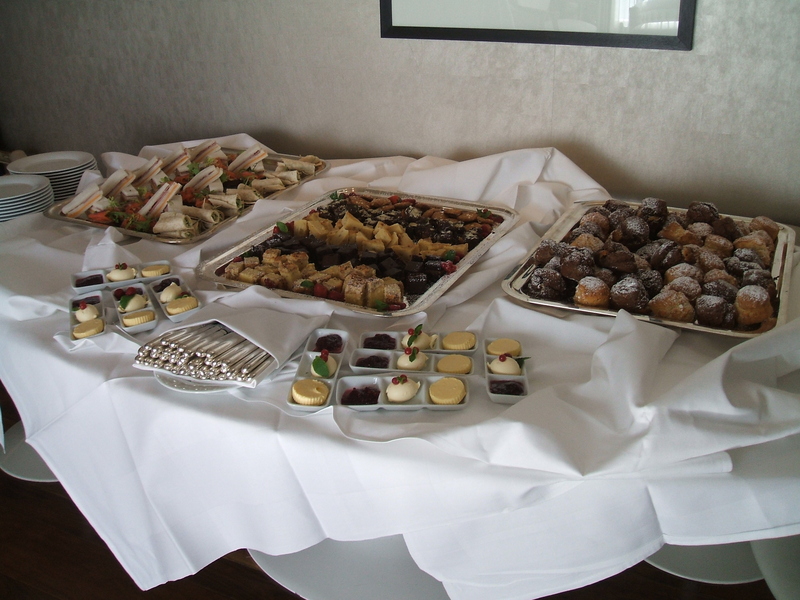 We also had tea and coffee to accompany the very tasty food. 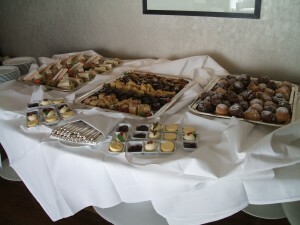 All too soon it was time to gather our goodies and head over to The Radisson Blu for the main event. The awards themselves were great, Damien Mulley the King of Blogging did a tremendous job of organising the event and our host for the evening for the fifth year running was the talented Rick O’Shea. Last year the theme for the evening was a wedding with a bride processing in full regalia, and this year a funeral for the death of Blogging complete with coffin and pallbearers. 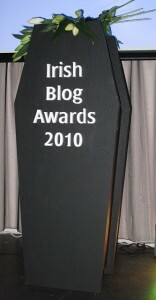 In the past few weeks there have been many articles written in the papers and on Blogs stating that Blogging was dead! Saturday night proved these statements to be far from the truth. 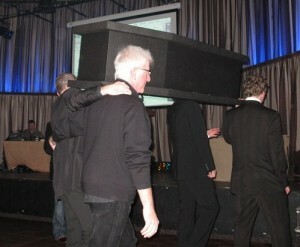 Upended coffin topped with lillies decorated the stage. Then it was down to the serious business of catching up with old friends and meeting so many new faces. The clocks springing forward magically means I have no idea if I was going to bed with old time or new! Now what have I forgotten…..? This entry was posted in Blogging on March 30, 2010 by Grannymar. 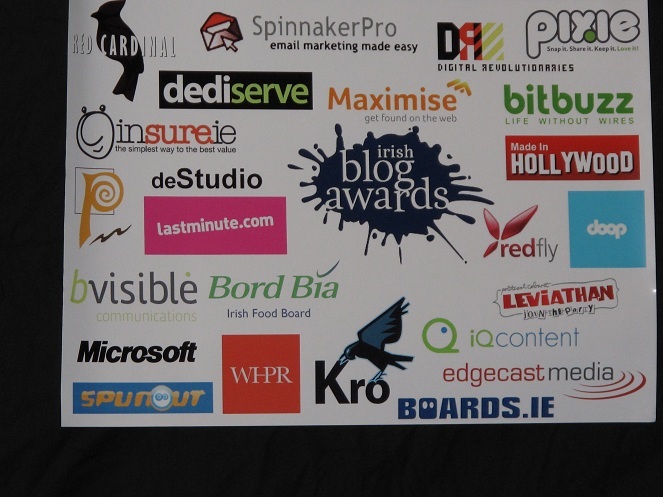 Then the Party that is The Irish Blog Awards began! What a night. Once again I am leaving, not on a jet plane, but with a heavy heart. Why? 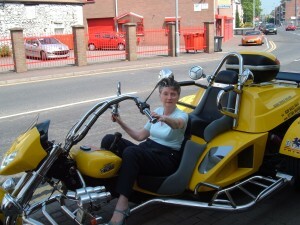 Because I must go home without all my friends, old and new and return to Co Antrim. Pity they would not all fit in my little house. Now there’s an idea. If I add on a little extension to my house we could hold IBA 2011 in Co Antrim. What do you think? The whole day was wonderful.. and I do have tales to tell, but tummy talks… well shouts right now for food. and best of all Really great people. I have no voice left today and my arms ache from all the hugging. This entry was posted in Blogging on March 28, 2010 by Grannymar. I definitely heard her. Nobody else has a voice like that. I wouldn’t mind, but I had my deaf ear to the door. “Are you dressed yet!” She hollers from the bottom of the stairs. How did she know I was still surfing? The bedroom door was closed. I had the mute button pressed so there was no sound. Now I know when Elly was small I saw things with the eyes in the back of my head. Things have advanced so much since those far off days. I wonder…..? Do you think Nurse Hitler has X-ray eyes that see through walls. I hear the car starting….. so I better hurry up. Have a nice day. If you are good I’ll bring you back a stick of Rock. Wait! Wait! I forgot my killer heels! This entry was posted in Blogging on March 27, 2010 by Grannymar. Our Loose Blogging consortium of Anu, Ashok, Conrad, Gaelikaa, Ginger, Judy, Magpie 11, Maria, Ramana and I, well those of us not on holiday or distracted by the calls of work, study or family concerns, turn our thoughts to the topic for the week, wickedly chosen today by me! 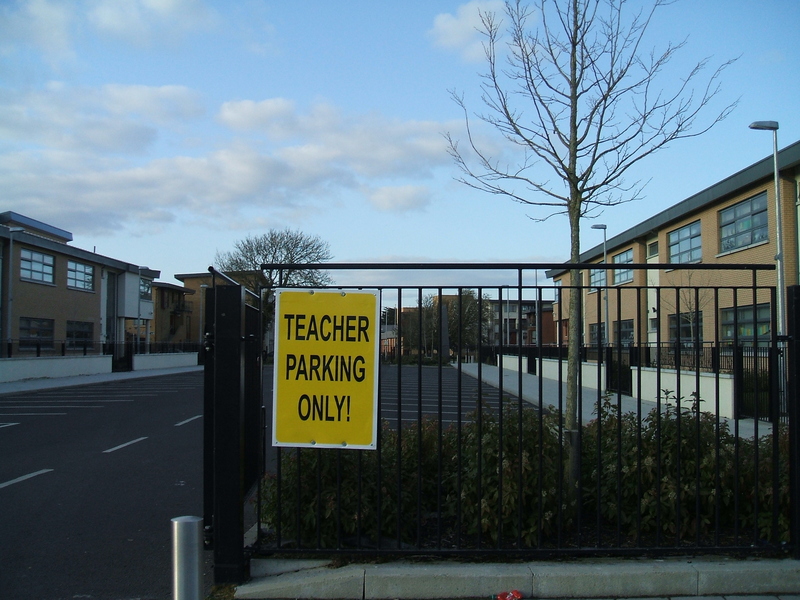 That was no good when I went to secondary school. We had an art class every week. At that stage I never heard of LS Lowry and his Matchstalk men and Matchstalk cats and dogs. I knew how to strike a match, well you needed to do that to light the gas. Any figures I drew had a circle for the head atop an inverted Y and a horizontal line for the arms. This teacher wanted me to work from an invisible dot or point in the middle of the page?? I had to look at whatever she had chosen that week…. WITH ONE EYE CLOSED…. and the other one squinted!!!! That was hard work. By the time I found the invisible point on the page, I had forgotten what we had been squinting at and which eye was squinting and which one was closed! As sure as god made little apples, I switched eyes every time! So after a couple of frustrated tear-stained weeks for me, the art teacher gave up and we moved on to using brushes and Poster paints. Since the month was October, she decided we would all paint a picture of Autumn. This chore task was given to us for homework. Space was needed to spread out art paper, brushes, paints and the dish of water needed to begin this masterpiece. Messy jobs were to be done in the kitchen (Mammy’s law! ), but this meant that I had to wait until the dinner was over and the dishes cleared, washed and put away before I could get near the table. We did have a dishwasher back then – ME! So here I was at last settled at the kitchen table, when mammy comes into the room. “What are you doing?” asks mammy, only half glancing in my direction. “I have to put on a wash.” I answer, trying to sound very knowledgeable. Eventually after several interruptions my masterpiece was complete…. if you couldn’t see a tree with leaves of green, orange and reddy brown drifting majestically to the ground; you had to be blind or in need of glasses! Pablo Picasso couldn’t do any better. Mammy told me it was lovely and we left it to dry on the table overnight. Alas, the teacher was not so easy to impress the next day. From there on she just about acknowledged me in the class from week to week. The weeks rolled on and we covered winter, spring and summer. The squiggly tree made regular appearances wearing a different dress each time. When the teacher had enough of my tree she changed tac… We were to produce a picture of heaven! How in all that was good and holy, were we going to do that? Nobody ever came back to tell us what heaven was like! We then moved to hell. I said HELL! Now I had a choice, but it would be difficult to get my ideas on paper. It would involve plenty of squinting and shut-eye. Idea number one was rejected…. I had enough of peeling spuds for half of Ireland without peeling more so I could draw them. It would have to be idea No. 2. There would be no flames of fire or demons with forked tails for me. We had enough around the dinner table that night to replay the loaves and fishes. When the meal was over and the table cleared, I shooed everyone out of the kitchen and prepared to begin. There were dirty dishes stacked high as mountains everywhere, bundles of cutlery enough for an army and added to this were the pots and pans. I was going to get this one right first time. The invisible dot was made visible and my pencil was held before my squinting eye at least 100 times. For once in my life the lines landed where I wanted them and the shapes were recognisable. 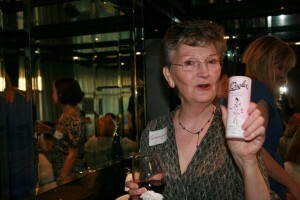 As Ramana would say “My Muse was working for me that night”! Slowly my efforts were beginning to take shape. The kitchen was deathly quiet. Mammy appeared twice to know if the dishes were washed yet. “I am nearly finished” I said “I will wash them in a few minutes”. Eventually I stood back to look at my work. Smiling to myself and feeling satisfied, I rolled the drawing and put an elastic band around it. There would be no need for paints tonight. Pushing up my sleeves I donned an apron and began to work on the detritus of the evening meal. I sang to myself as I worked, for once the mountain was not an obstacle. It was still not a problem as I put the last dish away and mammy arrived to start on the supper for the twelve tribes of Cahirciveen. Content that my homework was complete for the evening I set to buttering a couple of loaves of bread to make sandwiches. An intolerance for digesting butter was not sufficient excuse to prevent me from sandwich duty. I spread my precious homework across the desk. She smiled. THE ART TEACHER ACTUALLY SMILED AT MY WORK! My picture of hell was that kitchen piled high with dirty dishes! This entry was posted in Loose Consortium Blogging on March 26, 2010 by Grannymar. Now I am ready for the Party of the Year! Il s’agit blog post Mille deux cent cinquante! Yes. This is Blog Post 1250. Now I need a little rest before the LBC gang appear at 3pm. This entry was posted in Uncategorized on March 26, 2010 by Grannymar. I am sorry to say this will be my last blog post. Things have been a bit tough lately and life is getting shorter and shorter every day. I want to take time to see this great world of ours. So, I am leaving home. world and enjoy life while I still can. Don’t worry about me – they all seem like really nice people. AND YES, YOU CAN COME!!!!! Yes friends, you are the only ones with whom I would share these boy toys. 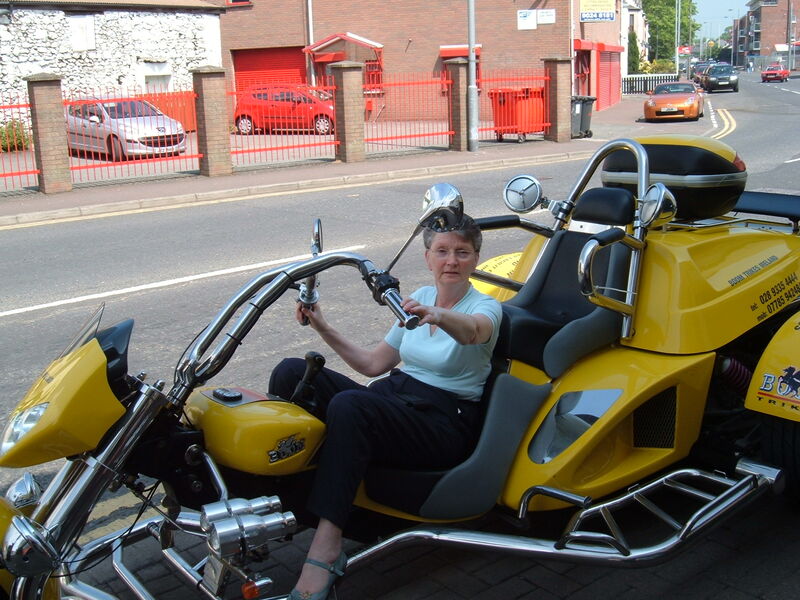 So rev-up the Harley Davidsons and l”ll pick you up, as soon as I can get this damn motorcycle of mine all the way to Galway. Just in case you didn’t realise… today is Thursday! 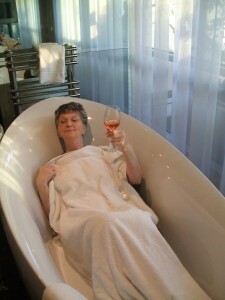 This entry was posted in humour on March 25, 2010 by Grannymar. 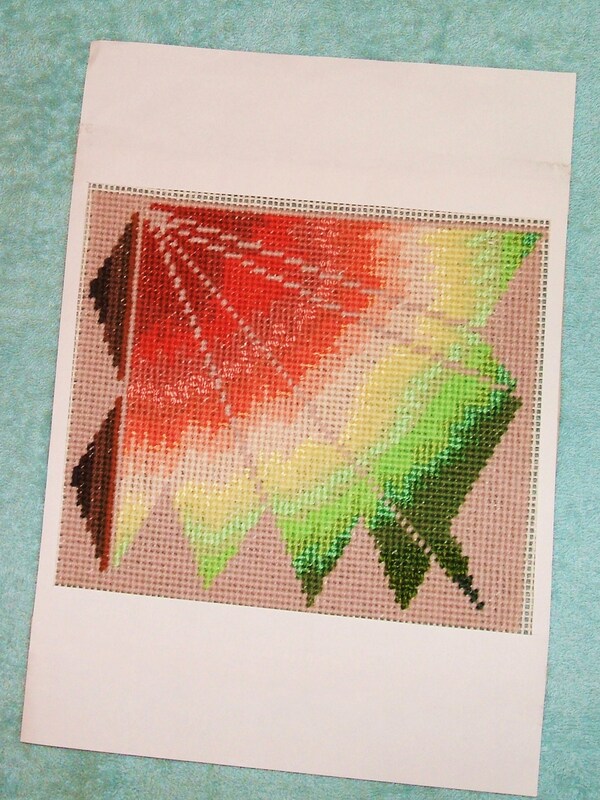 About three weeks ago the craft post was about my beginnings with cross stitch on evenweave, today I want to show you something not a millions away – canvas work. 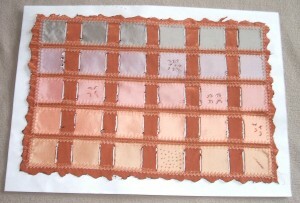 The stitches are worked in rows in a line of diagonals facing in one direction. 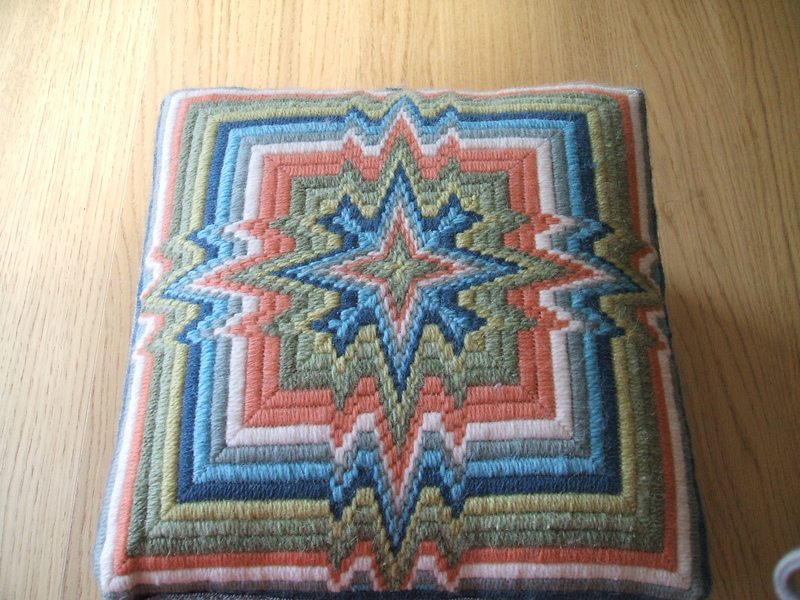 The piece above has some different textured threads worked through the pattern. 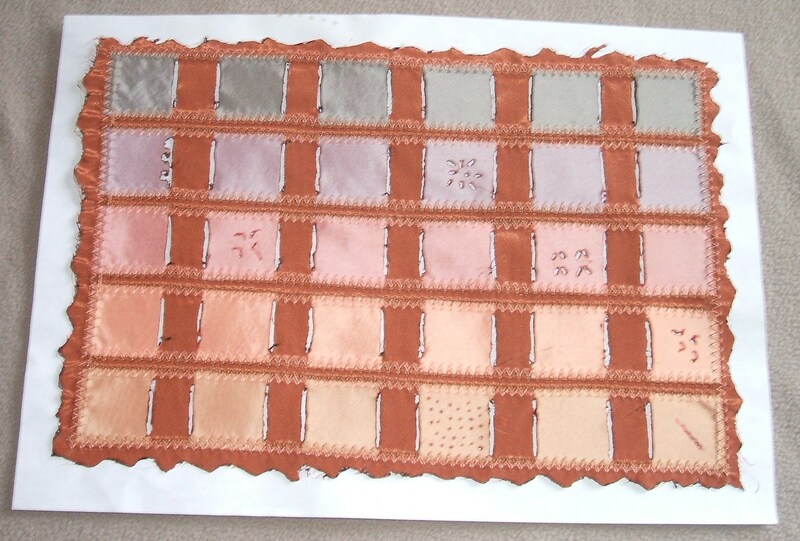 This square is worked in straight stitch (vertical or horizontal) and started in the centre of the piece, using carpet thrums – the threads left on a weaving loom after the cloth has been remove. If you live near a carpet factory it is possible to buy a bundle or bagful quite cheap. Usually they come in a mixed bag and half the fun is sorting and sifting the colours. It can be a little dusty so wear a face mask if you are worried about inhaling the fibres. 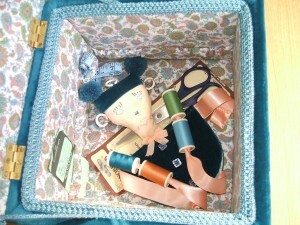 Like so many of my stories they begin with a bundle of energy that masqueraded as my doll Elly! We received a gift for her Christening from a Master Baker employed in the same company as Jack. When he (the baker) came to Northern Ireland for Shows and demonstrations, it was down to Jack to look after him for the week. Many times he joined us at home for a meal in the evenings. So this gift was a little thank you for our hospitality. It was a christening cake and it arrived in a wooden box. Recycling may be the ‘IN’ thing right now, but I was well converted long ago. A wooden box… I would find good use for it some day so set it on a shelf in the garage. With the eventually of gradualness, my princess found her toddling feet. Being of strong independent mind she wanted to do everything unaided and this included sitting on the throne! Thrones are a little high for little legs, so mammy set her mind to solving the problem…. 💡 The box! I gave it a coat of paint and it became a much needed step! Time passed, legs grew and the step/box was redundant once more. Carefully scouring and returning it to the shelf I vowed I would give it a new life one day. 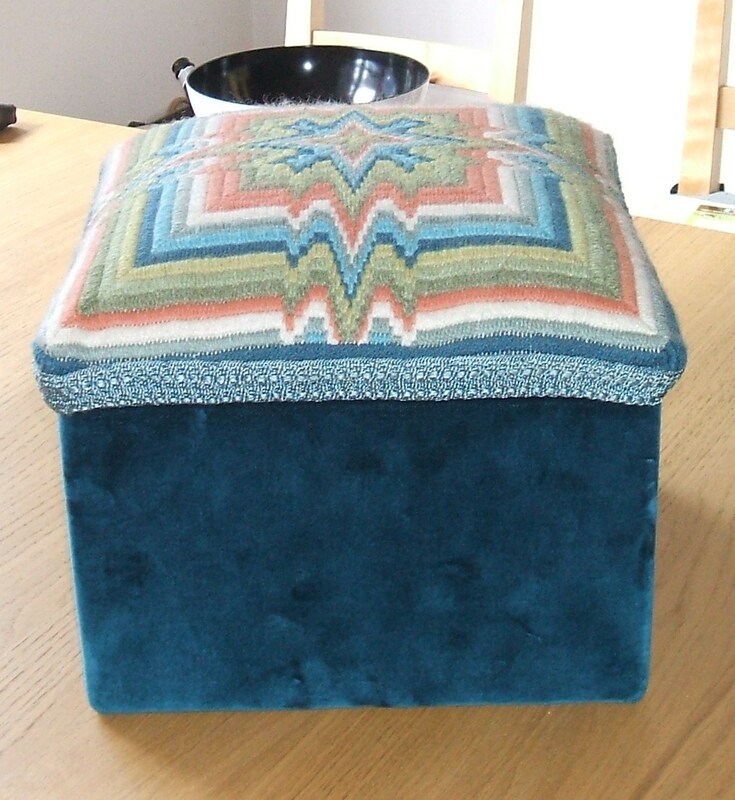 A few years passed and once more my attention was drawn to the box… removing the top completely I covered and lined the inside and outside in fabric and worked the piece above for the top. Ah! 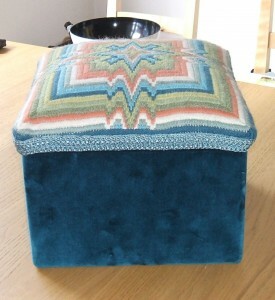 A handy foot stool I hear you say,,, well maybe but it has another life too…. 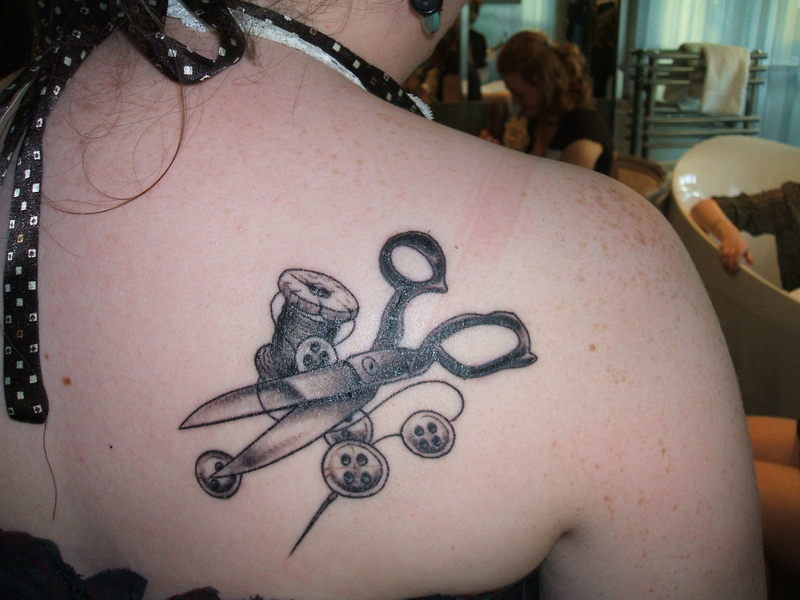 Not much sewing going on here, since the scissors is still in the packaging. 😉 But why would she when she still has a mammy to do it for her! The little Gigolo has a story to him. 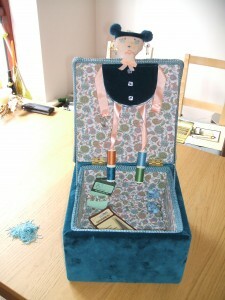 he was not made by my fair hands, I do have one that I made many years earlier to match a workbox of my own. This little Georgio was made by a young Elly, it is a needle case and ALL the work was her own. Always one to jump in at the deep end, this was her first attempt at real sewing and craft work! I supervised to make sure that no fingers were lost in to process, and as she used my electric sewing machine for the first time. I do have the pattern for Georgio Gigolo somewhere so if you are interested let me know in the comments and I will go into more detail another week. Bye the way Elly, I just realised that the three buttons on the front of the needlecase are real glass. I originally had six, they were given to my by the late Mary Moreton. I had forgotten we used them here, I searched high up and low down for them when making your wedding outfit. Two were used on your wedding outfit to hold the tiny bag of ‘Something old, new, borrowed and blue’! This entry was posted in Crafts on March 24, 2010 by Grannymar. How would you park a teacher? This entry was posted in Photography on March 23, 2010 by Grannymar.